Adding to the queue of Vision Gran Turismo Concepts we have a new member in family from the house of Volkswagen. 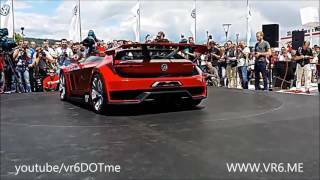 At the Worthersee Festival in Australia, company unveiled its all new Volkswagen GTI Roadster Concept 2014. Carrying company’s hatchback legacy the concept with it brings sportier package. 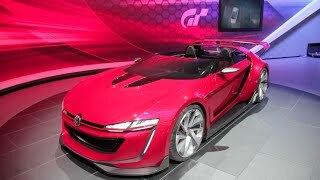 Let us have a look at the review of Volkswagen GTI Roadster Concept 2014; a new member in the gaming family. Interior of Volkswagen GTI Roadster Concept 2014 is indeed a treat for eyes. Cabin is separated from center through an ‘open bar’ as company calls it. This separation extends it way from cabin till the rear and house a fire extinguisher in it. Equipped with Alcantara wrapped sports seats carbon fiber surrounds add to the gleam while the five-point safety belts keep the safety intact. Drenched in black the interior of Volkswagen GTI Roadster Concept 2014 gets sportier with accents of red adding the star-badges in its overall looks. Over the dashboard is mounted a race-oriented steering wheel featuring four-spoke grip design and is well in command sitting over a long column amidst the light switches and red colored shift paddles. The exterior of Volkswagen GTI Roadster Concept 2014 is sleek and broad; to us it bears lot resemblance to Scirocco. Apart from this numerous aerodynamic upgrades have been integrated to make it a truly performance oriented four-wheel drive. This includes a massive rear wing, rear diffuser and a front splitter, also contributing to this queue is low cut windshield. Starting with the front fascia of Volkswagen GTI Roadster Concept you’ll find vertically standing LED DRL units accompanied by large air intakes. Headlamps portray a slim look get further connected to grille which is narrow in shape and splatters an aggressive look in all complimented by a narrow strip. Moving towards rear fascia of Volkswagen GTI Roadster Concept, as mentioned above the first thing you’ll notice is a diffuser with its huge blades and a pair of tailpipes wrapped in a larger trapezoidal tip. Over the 20” wheels, Volkswagen GTI Roadster Concept 2014 carries a 3.0 Liter twin-turbo TSI engine generating total output of 503 hp and peak torque of 560 nm paired to seven-speed DSG transmission. 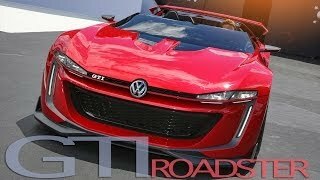 With this power propelling its massive wheels the top speed of Volkswagen GTI Roadster Concept 2014 touches mark of 190 mph and can sprint from 0-62 mph in just 3.6 seconds.